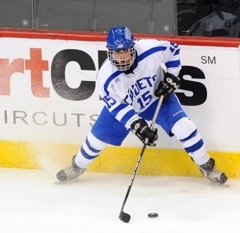 When St. Thomas Academy won the Class 1A state title in 2008, freshman Zach Schroeder must have assumed the good times – and the winning -- would last forever. 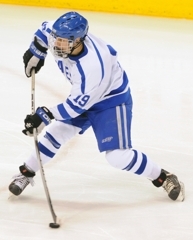 Just two years earlier, he watched his older brother Jordan Schroeder lead the Cadets to a state title, before Jordan moved on to the U.S. National Team Development Program, the University of Minnesota and eventually as a draft pick of the NHL’s Vancouver Canucks. With those bloodlines and St. Thomas Academy’s pipeline of talent, Zach seemed destined to win multiple state championships. 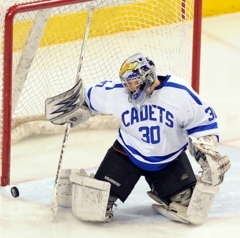 Three years later he has a different perspective, one gained after two disappointing upsets to Mahtomedi in the Section 4A finals kept the Cadets from returning to the Xcel Energy Center in St. Paul. 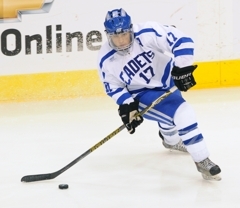 What once appeared to be a St. Thomas Academy dynasty has turned into one last gasp for the Cadets’ senior class – including Schroeder. Talk about making up for last time. 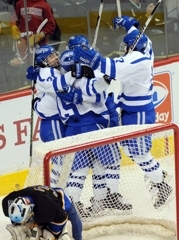 Behind Schroeder’s two goals, top-seeded St. Thomas Academy (24-6-0) cruised to a 5-0 victory over Thief River Falls (20-9-1) in the Class A semifinals Friday afternoon – earning a spot in the state title game. Zach received a text message from his older brother before the semifinals, with a few short words of advice. “He said, ‘Good luck and lead the team like you have all year and good things will come,' ” said Schroeder, who admitted that Jordan tends to not be overbearing with his advice. Like all younger brothers, Zach wants to create his own legacy. He certainly did in the state semifinals Friday afternoon. Schroeder broke a scoreless duel with just 17.9 seconds left in the first, taking a pass from linemate A.J. Reid, who also played as a freshman on that 2008 squad. On his second goal, which extended the Cadets’ lead to 4-0 midway through the third period, Schroeder did most of the work himself. 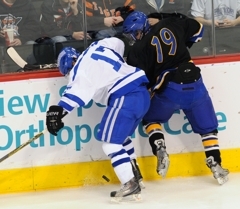 He again took a pass from Reid, dangled past the Prowlers’ defenseman and ripped a shot through goaltender Jon Narverud. 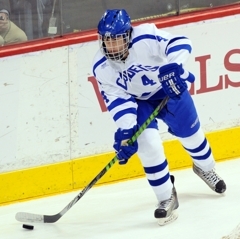 “That line can really motor and create some things,” said St. Thomas Academy co-head coach Greg Vannelli, calling out Schroeder, Reid and Matt Kroska. 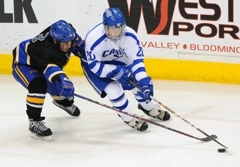 Eric Schurhamer, Alex Johnson and Andrew Commers also scored for the Cadets, who outshot Thief River Falls 29-11. 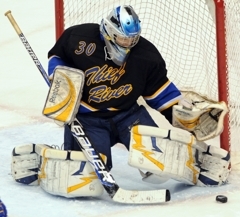 David Zevnik posted an 11-save shutout, while Narverud had 24 saves for the Prowlers. St. Thomas Academy will face No. 2 Hermantown, a 6-4 winner over Hibbing/Chisholm in the other semifinal, in the Class A state championship Saturday afternoon at noon. 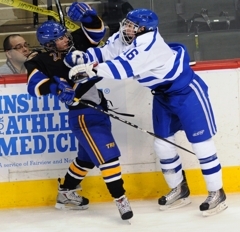 Schroeder has fond memories of his last trip to the finals, even though he didn’t appear in the game, a 5-1 victory over Duluth Marshall. Schroeder will undoubtedly be a much bigger factor in Saturday afternoon’s final, just as he has throughout the Cadets’ season. 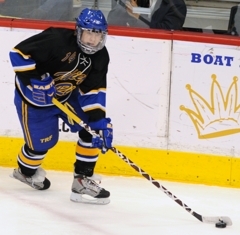 The 5-foot-10, 165-pound senior leads the team in scoring with 62 points (27 goals, 35 assists). It’s the matchup people have been waiting for all year. 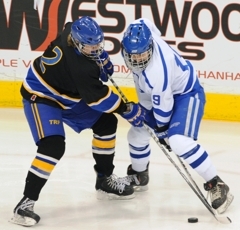 Throughout the season, St. Thomas Academy and Hermantown have both been ranked No. 1 at one point with the other team being ranked No. 2. Now, the two teams will finally be able to see who the true No. 1 seed is as the Cadets and Hawks will meet in the Class 1A championship game on Saturday, March 12, noon. 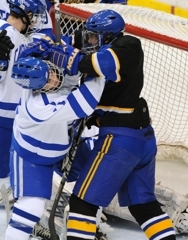 It seems as though St. Thomas Academy is showing exactly what its about with impressive tournament victories so far -- a 13-2 quarterfinal win over New Ulm and the 5-0 semifinal win over Thief River Falls. However, Reid and the Cadets are not satisfied. As a private school from the cities at the center of controversy regarding class 1A or 2A status, Reid knows the crowd at the Xcel Energy Center during the title game may not be a friendly one. 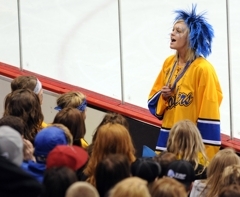 Cheers from student sections and fan sections alike during the Cadets’ semifinal matchup against Thief River Falls on Friday, March 11, were loud and usually directed at St. Thomas Academy. Despite the busy arena, Reid and the Cadets could hear the banter. 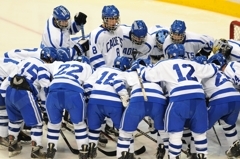 Time will tell if St. Thomas Academy still has the goals and if the Cadets can win their third title in six years. “Tomorrow we’re just going to have come with everything we got,” Reid said. “It’s a new game, a new start, zero-zero and we just have to come ready to play every shift. 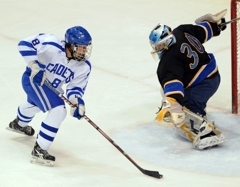 As a freshman, Schroeder was part of the Cadets’ 2008 state championship team. 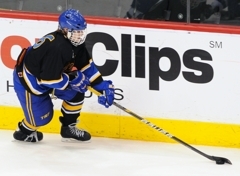 But he certainly wasn’t an integral cog, which the rocket-fueled RPI recruit proved to be yet again this season with two goals and an assist in the Cadets' semifinal rout of Thief River Falls. The senior has 27 goals this season. 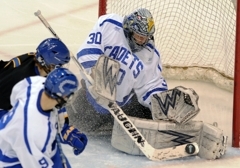 A sophomore, Zevnik made 12 saves to record his fourth shutout in five playoff starts. He lowered his goals-against average for the season to 1.79 and bumped his save percentage to .914. The senior forward provided poise and leadership for the Cadets, and threw in a couple of assists for good measure. A.J. 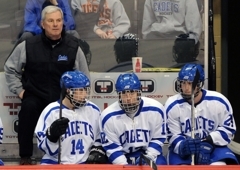 Reid enjoyed helping St. Thomas Academy’s boys’ hockey team win the 2008 Class 1A title so much, he planned to make it an annual event. Reid, then a freshman, learned a hard lesson in appreciation as the Cadets fell one game short of the tournament the next two seasons. 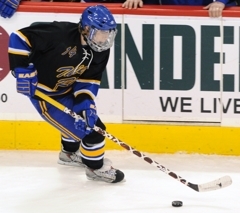 With a 5-0 victory against Thief River Falls in Friday’s semifinals, Reid and the No. 1-seeded Cadets earned a spot in the championship game. They play No. 2 seed Hermantown at noon Saturday at Xcel Energy Center. Hermantown (25-3-2) lost to Breck 2-1 in the championship game last season, but the Hawks are not alone in their hunger for redemption. “We’ve worked hard in the weight room the whole season and that’s made us able to wear teams down,” Reid said. The Cadets’ speed and tenacity wore down the Prowlers mentality and physically. Reid set up the Cadets’ first goal by creating a turnover at the Thief River Falls blue line and sliding the puck to a streaking Zach Schroeder to bury with 18 seconds remaining in the first period. Schroeder scored again at 7:17 of the third period to give the Cadets (24-6-0) a comfortable 4-0 lead. The Prowlers (20-9-1) got 12 shots on goal for the game. “The longer it took for us to maybe get one, the tighter the sticks got and the heavier our legs got,” Thief River Falls coach Tim Bergland said. Reid and Schroeder played on the Cadets’ 2008 title team, though Schroeder missed the best part of the championship game while receiving medical attention for a laceration caused by a skate.